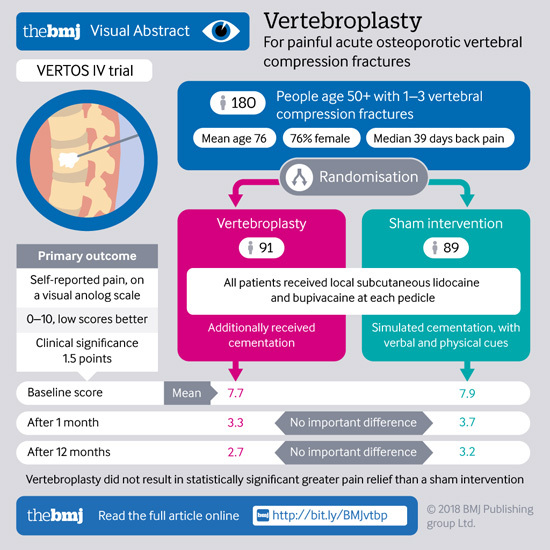 Vertebroplasty (surgery to repair spinal fractures) is no more effective for pain relief than a sham (placebo) procedure in older patients with osteoporosis, finds a trial published by The BMJ. The researchers say their results "do not support vertebroplasty as standard pain treatment in patients with osteoporotic vertebral fractures." Vertebroplasty involves injecting a special cement into the fractured bone to stabilize it and to relieve pain. But previous studies have reported conflicting results and there is ongoing debate about its benefits, risks, and cost-effectiveness. To try to resolve this uncertainty, researchers in the Netherlands and the USA compared pain relief in patients undergoing vertebroplasty or a sham procedure, where patients are given local anesthetic injections, but no bone cement. "Percutaneous vertebroplasty to treat patients with acute osteoporotic vertebral compression fractures did not result in statistically significant more pain relief than a sham procedure during 12 months' follow-up," the researchers say. They point to some study limitations, such as lack of an untreated control group and limited generalizability to other treatments. However, strengths over previous trials included larger patient groups and longer follow-up. They believe there is a place for vertebroplasty "when efficacy outweighs the risks," but conclude that these results "do not support using percutaneous vertebroplasty as standard pain treatment in patients with acute osteoporotic vertebral compression fractures." This trial suggests that vertebroplasty "should not be offered to patients with three or fewer painful osteoporotic vertebral fractures of less than six to nine weeks' duration," says Evan Davies, consultant spinal surgeon at Southampton General Hospital, in a linked editorial. These are fruitful areas for further research, he wrote. In the meantime, early vertebroplasty—before nine weeks—"should probably be considered only in exceptional circumstances for patients with vertebral osteoporotic fractures."